It’s getting towards the end of January, I have a brand new art journal ( I bought the bound Strathmore one) and I have quite a few pages from my finished journal that I still haven’t posted about…so here they are! I’ll spread them over 2 posts. This is one I started in Zom’s class.We were meant to use a photocopy of some part of our body but I’ve recently fallen in love with some scrapbook papers so I decided to cut my hand out of one of those. 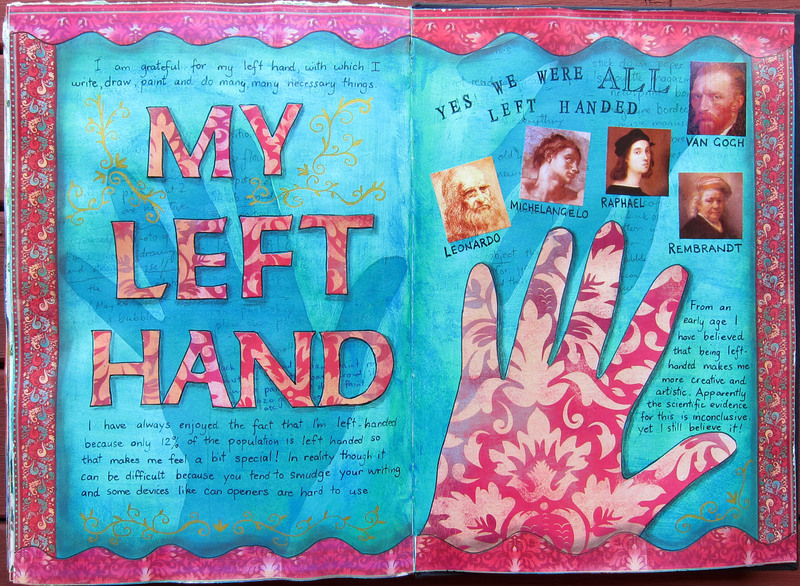 I wrote about being left handed, whether or not that makes me “artistic” and I added some pics of some famous left handed artists. 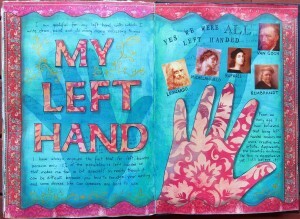 I love this page, esp the silhouettes of my hand in the background, created with gesso resist. This next page was mostly done in class also. People had brought in tarot and other divination cards and we chose 2 of them for our writing prompt. “Knowledge” was one of the cards I pulled and I ended up writing about what I would like to read over the next few months. 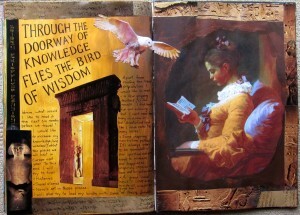 I had a bunch of images that I carry to class, including this beautiful painting of the reading woman. She seemed to want to be on the page with the ancient writing and statues so I just tied them all together with some burnt umber and yellow ochre paint. 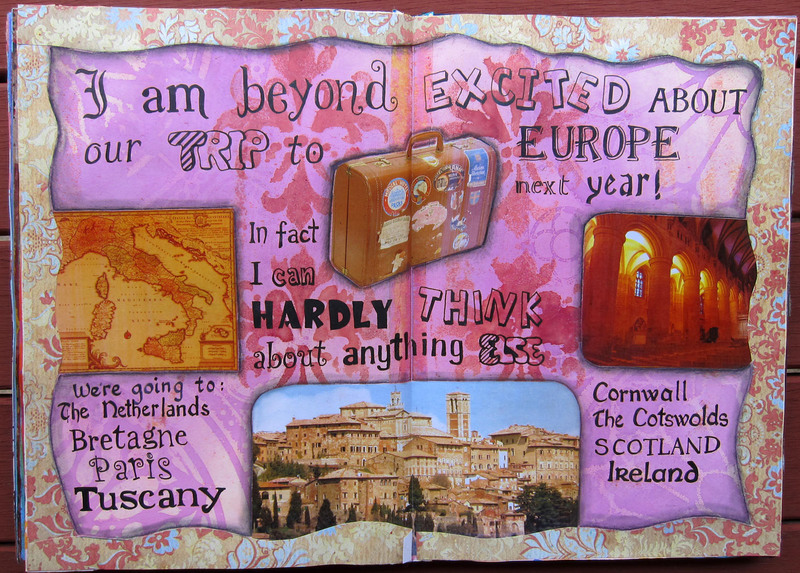 The whole page came together really fast and was very meaningful to me…I love it when that happens! 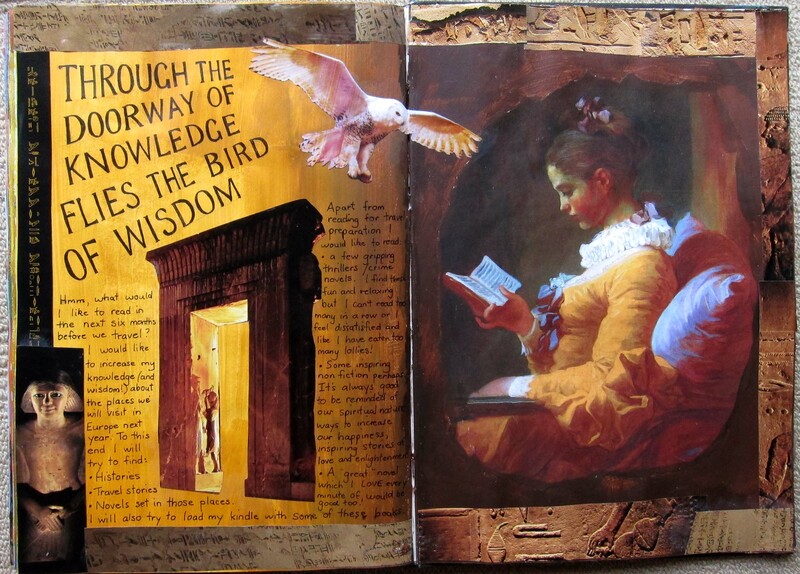 I added the bird when I got home and then the sentence “through the doorway of knowledge flies the bird of wisdom” just popped into my head and became the title of the page. 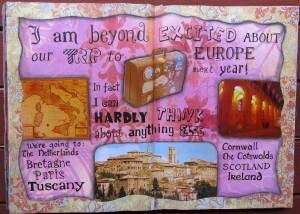 Here is a page about our coming trip to Europe and how excited I am about it. I had lots of fun experimenting with writing in many different fonts..I’m a bit of a font lover, I think it dates back to my childhood days. When I was 10 I was sent to the opportunity school in Summer Hill and we had to buy the Speedball book of writing. We were expected to copy fancy fonts for heading on all our work and I loved it, especially the “old english” font. It’s much easier now to find interesting fonts, I’m always downloading them from free font sites on the net.